The pork kidney is a single-lobed glandular organ, which is best taken from a younger animal to provide a milder taste and more tender meat. 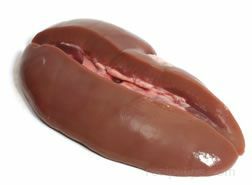 The kidneys from an older animal will have a dark reddish brown color and the younger animal's kidneys will be pale in comparison. Choose kidneys with a moist, even colored surface and firm texture.